The canoe encompasses a wide range of boats and activities from the open canadian used to paddle the peaceful backwaters of the wilderness to outrigger single bladed boats used by our paralympic paddlers and the excitement of the canadian whitewater and slalom paddlers. Recent additions to the world of canoe paddling include the Stand up Paddle Board (SUP) and Dragon Boating both increasing in popularity. 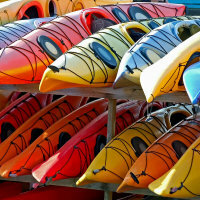 Our page on kayaks sets out the principle factors to look for in boat design and construction which will hold true for canoes whilst here we look in detail at the open canadian canoe its uses and specific features whilst providing links to our pages related to other single bladed craft. 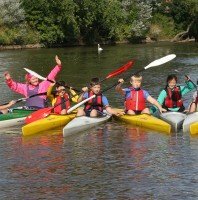 Our page on canoeing will lead you to all sorts of information on how you might use your canoe, advice on getting started, trips and tours etc. When we talk about canoes the image that most readily springs to most peoples mind is the open canadian. We picture it on a beautiful lake amid wild mountain scenery with the sun shining and a wilderness campground beckoning. Alternatively we might picture that same boat with a spray cover across the open deck bouncing down a sparkling rapid. In practice these boats are also used extensively by clubs and families to introduce children and adults of all ages to time on the water. There are a number of constructions methods and materials used to build these boats. The gunwales can be made of wood, aluminium or polyethylene whilst the hulls can be made of polyethylene, kevlar / fibreglass composites or wood. 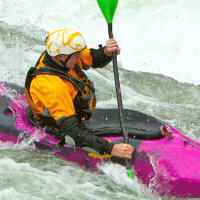 More details will be found in our section on kayak construction. Most mid market canoes use polyethylene for the hull. The advantages of this material are that it is very tough and resistant to wear although it is not the lightest of materials. These boats are the most economical and will take the knocks. Lighter modern boats will be made of some form of kevlar/carbon/ fibreglass composite. These materials layered up in a variety of ways create light stiff tough hulls suited to different purposes. These boats are more expensive than the polyethylene versions and need to be treated with a little more care but will handle much better. 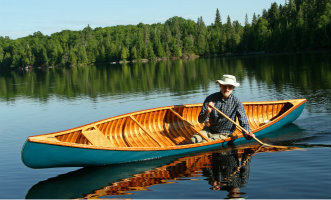 What could be more beautiful than a handcrafted wooden canoe? Wooden boats are still made by real craftsmen and as they will tell you are difficult to beat for long life, ability to be repaired. They can be light and responsive but may well put a good sized hole in your pocket! These are inevitably fairly wide boats and typically come in lengths from 14' to 20' to suit solo paddlers and up to 3 adults or 2 adults and some little people. Variations in design are largely around the amount of rocker and the cross-sectional shape of the boat. Reading our sections on kayak stability, speed and manoeuvrability will provide more information as much of the information holds true for both types of boat. If you read the section on rocker as it applies to kayak design you will find the same applies here. The more rocker the boat has (ie the more the ends curve up out of the water) the easier it will be to turn and manoeuvre but the harder it will be to keep tracking in a straight line. The bottom of the boat may be flat, slightly rounded or have a slight V.
Flat bottomed boats are very stable on flat water and are quite manoeuvrable, however the flat bottom can get pushed in, this shape is quite slow and the stability reduces when leaned and in waves. Boats with a shallow V are good in rough water, track well and have good stability in use. Set against this the V can get worn as it hits the ground first both in shallow water and off the water and it is not as quick as a shallow curved shape. The hull with a gentle curve to it is the fastest on flat water and more stable in use than the flat bottomed designs. It is also quite manoeuvrable if the boat also has some rocker. On the downside it is not so good in rough water and is the least stable initially. There is also the issue of the shape of the sides of the canoe. There are three possibilities: straight (as it sounds straight up and down), flared (getting wider as it goes up towards the gunwale) and Tumble home (the opposite of flared getting narrower from the waterline up towards the gunwale). In practice these shapes may vary along the length of the boat but in essence the tumblehome shape makes for the easiest stroke as the reach to the water is the most efficient. 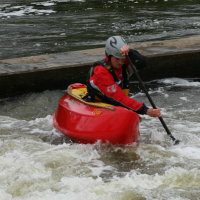 A straight sided boat has good stability and doesn't get you too wet from side waves that hit but is affected by wind whilst the flared sides make for the longest reach tot he water and therfore are not ideal for yourpaddle stroke but are stable, keep you dry and allow a narrower waterline encouraging speed and efficiency. Some combination of all these features will make for your perfect craft! 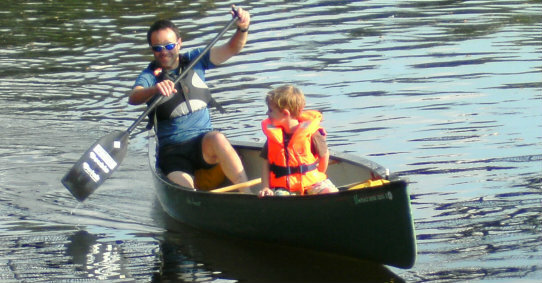 Such a versatile boat equally at home on a camping trip, running rapids or splash about fun for kids. The perfect craft for exploring the backwaters or the coast and landing that big one. At home in the surf or perfect extra support for para canoeists. No compromise racing speed machines, full respect to those that can paddle them well. Surfboards in the hands of paddlers make for new ways to play and get fit. With their origins in the Far East these boats bring paddlers together as teams worldwide. The thrills and spills of rafting. Big bouncy waves and loads of fun. A minority branch of paddling that can leave the inexperienced paddler in a spin. Easy crew boats to get more children on the water with a paddle in their hands.